Hello - I have joined the forum in the hope that someone might be able to identify the attached armorial. It appears on a gold seal ring which I understand dates from the early 19th century. There is no maker's mark on the ring to help with the provenance, and no motto. I have reversed the image so that it now appears as is would on the wax. There is a strong hunting and falconry theme. The upper part of the shield, showing a falcon displayed, is engraved with small dots which I understand denotes "or". The lower part is difficult to decipher but may show a gloved hand holding arrows and reins, marked with vertical lines for "gules". The Somerset Herald at the College of Arms has been unable to identify the supporters or the shield and I suspect that the armorial is either entirely spurious or is continental. Any help or advice much appreciated. This has all the indications of being continental. 1 - No hallmark on the ring. Regardless of the heraldry, if it was UK made, there would be a hallmark. 2 - Gas bracket heraldry, or in this case shelf heraldry. So called because the supporters are standing on a curly line (that looks like a gas bracket), or the motto scroll, or as here on a shelf. The shelf was quite favoured in French heraldry. 3 - Part animals and people. Having just an arm and hand showing is a bit Eastern European. Poland/Lithuania or east from there. There is no listing in Papworth. I have so far searched 'Wapenkaart', an armorial of arms of the Low Countries - nothing there. I am currently searching 'Armorial Dubuisson' - The French armorial. It is in two volumes, some 500 odd pages with 12 shields per page. If I find nothing then it is off to Rolland's Rietstap - 216 pages with 56 shields per page! If this is not the same family then it must be closely related. The 'Bourg' stands for Bourgogne. I cannot work out what the second word is. There is no blazon. Can't thank you enough for the time and trouble you have taken in researching the armorial on this gold ring. Your findings come just when I was beginning to think I had drawn a blank, but I now have a great deal of information with which to make further study. I have made a little more progress with my research. I now know that the Bourgogne Region, in which Bourg, Piedmont and Collonges are located, was once part of the Duchy of Savoie and probably has strong ties to both Italy and Switzerland. I don't think it was ever part of the Holy Roman Empire. I think records for most of these can be found in libraries in the Cote d'Or Departement. Will have to ask French speaking friends in that part of the world to make enquiries. More work to do. Correction to my last post. The Duchy of Savoie was indeed a constituent state of the Holy Roman Empire until 1860 when, under the terms of the Treaty of Turin, the Duchy was annexed by France. One wonders where the allegiance of the de Massol family lay. It gets more and more involved. The ring pre-dates 1860. 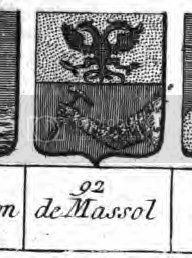 I am absolutely sure that this coat of arms does not belong to the Massol family. Massol are from Burgundy, the first to be known and the certified root of the current family is Augustin Massol married in 1487 with Jeanne Legoux and died in 1504. He was a doctor at the "Hospice de Beaune" and was supposed to come from Casal in Piedmont (Italy) as it was written on his grave. At that time part of this region was french. The french family Massol was supposed to be part of the Italian family Massola. Two members of that family, Francesco and his brother Guglielmo are supposed to be Augustin's oncle and father. They were anoblished by Maximilian the 1st, and were given a different coat of arms (a golden background with a red lion handling a hammer) because they were Ambassador to the french king. So the eagle with two heads, which is an Habsburg's symbol was probably given to the family earlier by the Emperor Friedrich. There is still a Palazzo Mazzola in Asti (Italy) which is now the archives center for the town. The link between the french and the italian family is not well established but the french one always said they were from Italy and during the xviii century they did some research probably through the Cardinal de Bernis, Ambassador in Rome at that time.